Specificity: Has high specificity for the constitutively expressed Hdj2 compared to Hdj1 using recombinant controls. Scientific Background: Hdj2 is an approximately 40kDa member of the heat shock protein (Hsp40) family, a eukaryotic homolog of the E. coli DnaJ protein. Eukaryotic DnaJ-like proteins share structural domain conservation with DnaJ namely: 1) an N-terminal ~70 amino acid J domain, 2) a glycine- and phenylalanine-rich domain, 3) a cysteine-rich zinc finger domain, and 4) a poorly conserved C-terminal domain. The human constitutive Hdj2 protein shares full domain conservation with DnaJ, as opposed to the human inducible Hdj1 which lacks the zinc-finger domain. The Hsp40 J domain regulates its interaction with Hsp70 (E. coli DnaK), increasing Hsp70 ATPase activity and in turn enhancing substrate binding by the Hsp70 chaperone. Hsp40 co-chaperones are involved in nearly all aspects of protein synthesis and secretion because of their importance in Hsp70 function, and they are also thought to have an intrinsic ability to bind and fold some misfolded proteins. Hdj2 has been specifically shown to interact with Hsc70, the constitutive form of Hsp70, in the biogenesis of the cystic fibrosis transmembrane conductance regulator (CFTR), mutations of which are known to cause inherited cystic fibrosis. 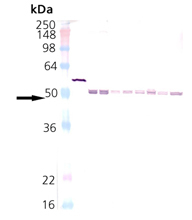 Western Blot Analysis of HSP40/Hdj2, pAb: Lane 1: MWM, Lane 2: Hsp40/Hdj2 Recombinant Human Protein (Prod. No. ADI-SPP-405), Lane 3: HeLa Cell Lysate (Prod. No. ADI-LYC-HL100), Lane 4: HeLa Cell Lysate, Heat Shocked (Prod. No. ADI-LYC-HL101), Lane 5: PC-12 Cell Lysate (Prod. No. ADI-LYC-PC100), Lane 6: PC-12 Cell Lysate, Heat Shocked (Prod. No. ADI-LYC-PC101), Lane 7: 3T3 Cell Lysate (Prod. No. ADI-LYC-3T100), Lane 8: 3T3 Cell Lysate, Heat Shocked (Prod. No. ADI-LYC-3T101), Lane 9: CHO-K1 Cell Lysate, Lane 10: CHO-K1 Cell Lysate, Heat Shocked.